On June 14th, 2007 at 4:30 p.m. the city of Moreno Valley California will unveil their new veterans monument that will have as its centerpiece the largest battle cross monument ever created. The monument sculpture was created by Baltimore artist and owner of The Large Art Company, Richard Rist. 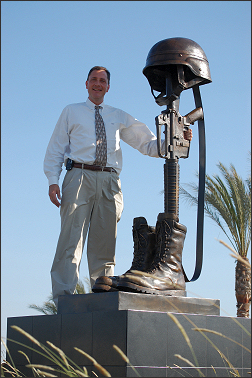 The sculpture is called the “Fallen Soldier” and consists of a pair of military boots, an M-16 machine gun with the barrel down between the boots, and a combat helmet on top, all created at two-times actual life size and cast in bronze. The entire sculpture measures 7 feet tall. The M-16 rifle measures 6 feet 6” in length, the combat boots are 24 inches long and 24 inches tall. The combat helmet has a circumference of 60 inches. These military accoutrements would fit a man approximately 13 feet tall. The weight is approximately 500 pounds. This project presented a number of artistic challenges. To recreate this sculpture at 2 times life-size, Mr. Rist employed the very latest in 3 dimensional laser scanning technologies. Each piece was scanned using the very same technology that is used by NASA and the Department of Defense to design and create the latest in space and military hardware. However, recreating the subtle detail and texture of the boots and helmet had never been tried before and proved challenging even for these rocket scientists. In order to get the minute detail in the laces of the boots, the scanning resolution was so high that the output data file was so large it would not even fit on most personal computers in use today. Once the scanning was complete it was sent for prototyping using a laser guided process that builds a replica of the original sculpture in a poly resin formula, one micron at a time. Although these machines move so fast you can’t even see them, each boot took two days to build using this process. The M-16 rifle at 2-times life-size was actually too big for the rapid prototyping machines and had to be created in 4 pieces and assembled. This use of 3-d laser scanning technology is somewhat new and capturing this level of detail was cutting edge. In fact, one boot had to be rejected because the data was flawed resulting in small triangular facets on the surface. Due to an extremely dedicated and talented team, the end result was absolutely amazing. Even the smallest detail was recreated on the larger sculptures. The concept of arranging military gear as a symbol of a fallen military service member has been around since at least WWI. The earliest recorded pictures show a 1903 Springfield rifle with the bayonet in the ground and a steal pot helmet on top; and was referred to as a Battle Cross. The arrangement evolved over time along with changes in military weaponry. At some point the fallen soldier’s boots were added to the arrangement reminiscent of the cowboy days when their empty boots came to symbolize the cowboy upon his death. Although battlefield memorials of this nature are recorded in previous wars, it wasn’t until the first gulf war that the arrangement became commonplace. When a combat soldier or marine was lost in the battlefield they would arrange their boots, rifle and helmet during the final role call. After the battle, the platoon leader would go through the list of names assigned to that unit. When they read out the name of a fallen comrade they repeat the name three times, waiting each time in deafening silence for a response. When no response is heard, a soldier steps forward and sticks their rifle with bayonet into the ground. A second soldier steps forward and places a combat helmet on top of the rifle. Then a third soldier steps forward placing the boots in front of the rifle facing the company and hangs the fallen soldier’s dog tags from the rifle. This sequence is repeated until everyone is accounted for. Once the roll call is complete and a battle cross has been assembled for every fallen soldier, a Chaplin will usually lead the troops in prayer. Then the surviving troops will walk by the arrangements one by one and pay their personal respects. As they morn, they will often reach out and fondle the hanging dog tags. Those that wish to speak may do so. Some will say a personal prayer, reminisce on a special relationship or recount a funny story. But make no mistake; this is a ceremony that is taken very seriously by the troops because these fallen soldiers are like family and every one of them knows that the next time they gather like this it might be for them. This is a deeply moving and emotional ceremony and the ultimate respect for a fallen comrade. Richard Rist is the owner of The Large Art Company, one of the most respected bronze sculpture companies in the United States. He is a navy veteran himself and comes from a military family. His brother served in the Army during Desert Storm, his father and several uncles served in WWII and Korea, and his grandfather served in WWI. He is a member of the American Legion and a life-member of the VFW. Mr. Rist made the first stand-alone bronze battle cross in 2003 and called it the “Fallen Soldier” or “Fallen Warrior.” The concept was to recreate the very meaningful tribute the troops use in the battlefield to honor their own. The life-size Fallen Soldier sculpture adorns over 100 monuments and memorials around the world including several in Iraq right now. Mr. Rist wanted to build a monument that would make you stop and think for a minute about the real cost of war and the individual sacrifice of those that gave it all defending our country. Its message is neither pro-war nor anti-war. And although this sculpture may represent many, it is not about body counts or casualty tallies, to Mr. Rist this sculpture symbolizes the importance of one lost life in the service of his/her country. He feels this is a fitting and dignified tribute to our troops and a memorial that will keep their memory alive in a permanent way. The Large Art Company gallery and sculpture studio are located in Baltimore Maryland. In additon to the life-size and now heroic Fallen Soldier, they have also made a number of monument and memorial sculptures around the United States. Their latest creation is 12 life-size portrait statues as a centerpiece for a new museum in Tennessee and is the second largest figurative sculpture display in the United States. For more information you can contact Mr. Rist at (800) 785-4278 - email Richard@LargeArt.com or visit www.LargeArt.com.